Hi, I’m Dr. Jarred Mait. I am a licensed general medicine and holistic physician with degrees from the University of Miami and Washington University in St. Louis. 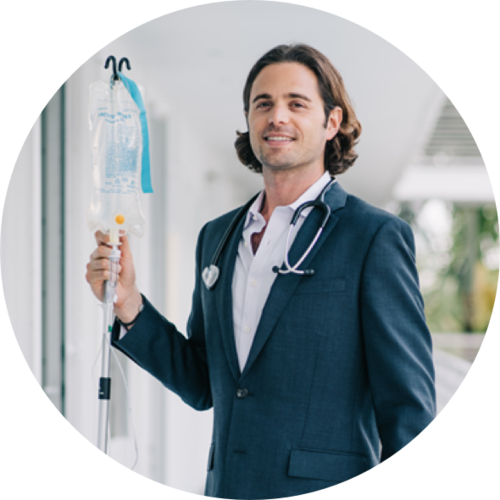 I created IVDIV to provide premier medically administered IV service in Miami. In the comfort of your home, office, or hotel, one of our highly-trained professionals will administer vitamins, minerals, nutrients, and medicines directly into your bloodstream. I provide the highest level of service to each patient. I spend quality time with my patients, typically 1-2 hours per visit. I take time to explain the underlying issues, the testing techniques and personally arrange for all aspects of the treatment plan. I incorporate western medicine, functional medicine, nutrition and integrative techniques with each patient treatment plan. I teach my patients about their body and how it works. I personally call specialists and arrange referrals. I provide in-home laboratory testing. I arrange all forms of imaging studies. I coordinate the delivery of vitamins, supplements and medications. I answer the phone personally. I am available to each of my patients, at all times. My patients have my cell phone number.